Marian Christopher Zacharow was born in Zamosc, Poland in 1954. He studied painting at the Academy of Fine Art in Krakow where he graduated in 1979. In 1981, Christopher left Poland for the United States and took up permanent residence in New York, NY. 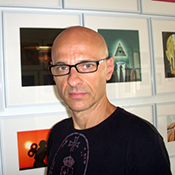 Christopher has established himself as a painter and notable illustrator. Among his various achievements, his illustrations have been featured in various well known magazines, including Time, The New York Times, Business Week, U.S. News and World Report, Newsweek, The Atlantic Monthly and Psychology Today. He has also created book cover art for publishers like Franklin Library, Viking Penguin, William Morrow, Harper Collins, Simon &amp; Schuster, Inc. Random House, among others. Christopher has been teaching painting at The Cooper Union since 1997. He has received many awards for his work including the Silver Medal from The Society of Illustrators of New York in 1986. Marian Christopher Zacharow has had 10 solo exhibitions in New York since 1983 and has participated in numerous group exhibitions in the U.S., Canada and Europe.